Protesters march to Swift Hall for a teach-in about racism in academia. The event was organized by both graduate and undergraduate student groups and is only the latest way students are showing their opposition to Satoshi Kanazawa’s controversial appointment. 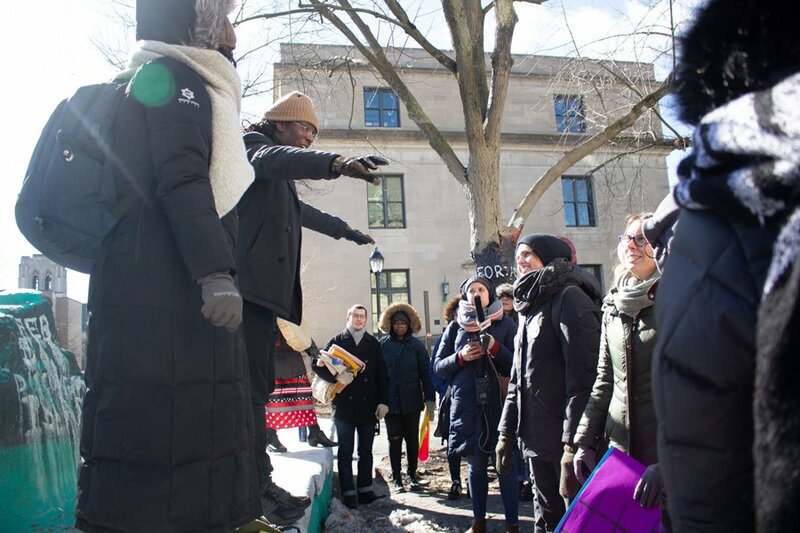 Student activists expressed their frustration over visiting scholar Satoshi Kanazawa’s continued presence on campus and learned about racism in academia at a march and teach-in event Friday. Kanazawa, whose work in the field of evolutionary psychology has been criticized as racist and misogynist, is at Northwestern this year while on sabbatical from the London School of Economics. Although he isn’t teaching or being paid, according to University leadership, his presence on campus has spurred outrage and calls for action from students. The march and teach-in, organized by several groups of both graduate and undergraduate students, is only the latest of several student-organized movements opposing Kanazawa. 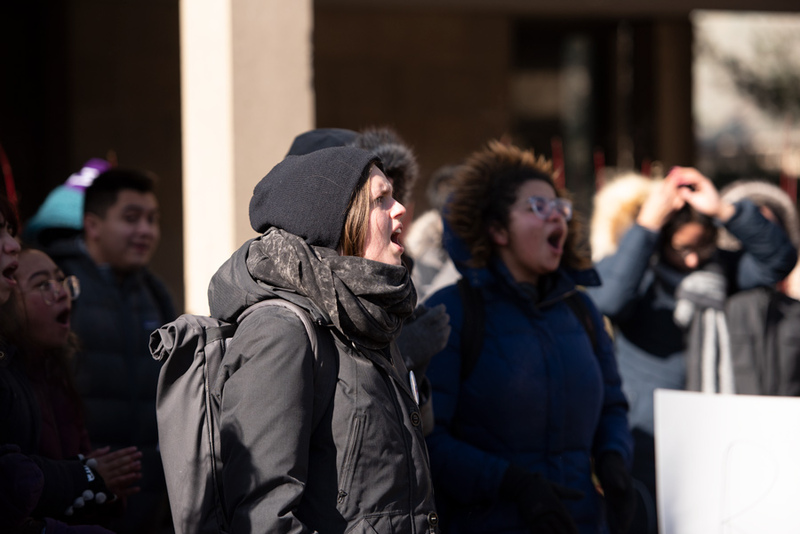 Activists circulated a petition in December calling for Kanazawa’s removal and took to direct confrontation after Provost Jonathan Holloway sent an email defending Kanazawa’s right to remain at Northwestern on the basis of academic freedom. 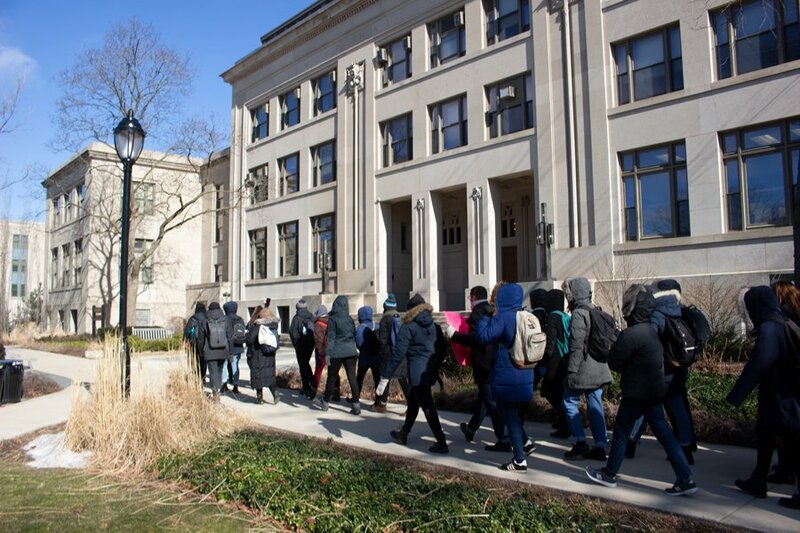 Students marched from The Rock to the Rebecca Crown Center, and then onto Swift Hall, where they settled in for a day full of breakout sessions. Protesters march to Swift Hall. Nikki McDaid-Morgan, a graduate student, is a member of the graduate student group Critical Contexts — one of the organizations that helped plan the event — and said students organized the event to speak out not just against Kanazawa but against arguments for academic freedom that permit “socially irresponsible” research. The breakout sessions, which lasted from 1:30 p.m. until 7:30 p.m., included unpacking the histories of academic freedom, scientific racism and coloniality; increasing compassion and empathy in University curriculum; the effects of a focus on academic freedom on non-dominant students; and prioritizing black women researchers. Students from Critical Contexts also created a list of working demands for administrators, which include that Holloway “clarify the position that the University has on the relationships between equity and justice to academic freedom” and the right to see the terms of Kanazawa’s visit at the University. The document is a work in progress, McDaid-Morgan said at the event, and Critical Contexts is open to suggestions. SESP lecturer Kalonji Nzinga, who led one of the event’s breakout sessions, said he’s impressed with how students have been organizing and sharing their opinions. SESP lecturer Kalonji Nzinga leads a chant at The Rock before the march beings. Nzinga said he’s noticed angry students in his classes as well as organized efforts –– like Associated Student Government’s resolution requesting administrators to force Kanazawa off campus. 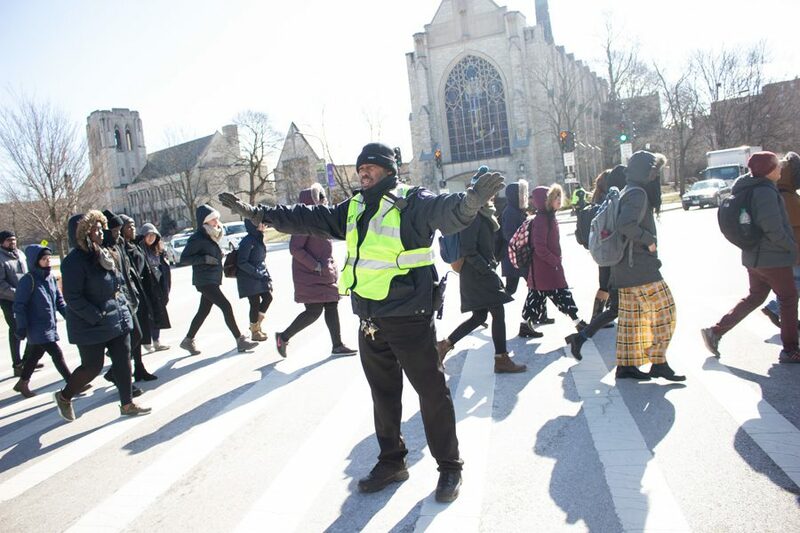 A University Police officer blocks traffic so marchers can cross Sheridan Rd. Medill sophomore Cayla Clements said she came to the teach-in because, as a black woman, she found Kanazawa’s research and ideas “hurtful.” She added that the University should be more considerate of students’ feelings and respond better to their demands. Though Holloway has previously expressed his personal distaste toward Kanazawa’s research findings and ideas, he said Kanazawa will remain on campus because of the University’s commitment to intellectual freedom. He has also describe the situation as “impossible” with no decent resolution to either outcome, and said he doesn’t believe the provost should have the power to remove someone from campus without the input of faculty and other administrators. 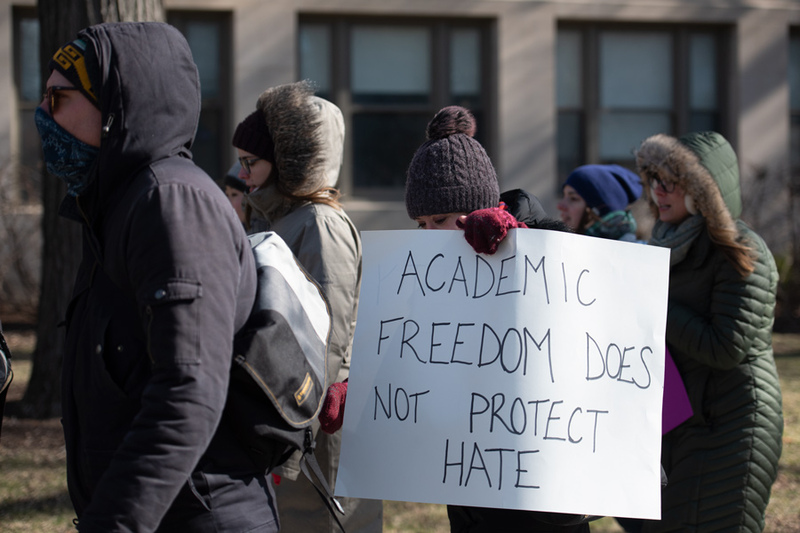 McDaid-Morgan said they think the University is taking academic freedom too far — and that researchers have an obligation to do work for the broader social good.